This photo was taken on May 16, 2018 at 5:13 AM. The "Take It!" came as I walked across a main street and had veered out of the cross walk at this early time in the morning on a rainy day. I am constantly keeping most of my visual focus downward as I walk for much of the sidewalk in the city is made up of concrete pavers which are placed tightly together. Many times they become uneven and offer trip able edges which I must watch out for. This "eyes cast downward” has its advantages including this photograph which to me is an unbelievable catch. 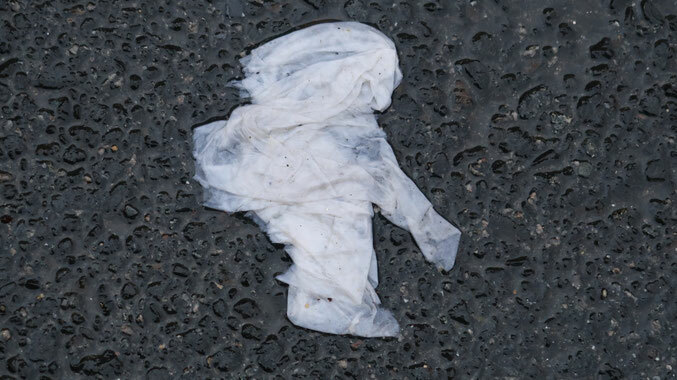 I first walked by this piece of paper, which looks like it may have been a tissue, and did not see the figure. I took perhaps two or three paces beyond it before it registered in my head that I had passed what my have been a recognizable form. I backtracked and immediately saw the little girl in the wet paper and took the photo. Fortunately the traffic volume had not really gotten started, enabling me to gather position for the photo. The After Take: I showed this to a number of people and gave my take of what it was before revealing the photo on the monitor on my camera. Everyone saw the likeness and joined me in the marvel of the catch. There is one of my regular "review committee" who has a very good imagination. For the fun of it, I presented the photo without having given my take on what I saw it to be, in advance and asked for his view of it. He quickly said he saw Neil Armstrong on the Moon. I saw the likeness to that famous photo and complemented him on his choice of that image. I then told him of the little girl with the backpack, and we agreed that the image had long hair which Neil did not have when he was on the Moon - lol. Lots of fun was had by all in the sharing of this, ever so lucky catch. I made certain to let everyone know I am grateful for having the good fortune to be able to see some of these comparisons as they make themselves available. Thank you for being a part of the fun of all of this. Our daughter says it looks like a ghost. Oh wow that’s cool, I can totally see it. Looks like it must be windy because her hair is going straight back, haha.